GEOCONCEPT announces Opti-Time Cloud 2.0, the new version of its field service management cloud application Fully integrated with the Salesforce environment, the Opti-Time Cloud app enhances the client relationship with intelligence and geographical optimization. In the new version 2.0, sales and technical teams benefit from Geoplanning for pinpoint, relevant, rapid and lower cost calls. The power of Geo-optimization in the cloud Opti-Time Cloud enables the benefits of Geo-optimization (mapping the customer portfolio, route optimization, Geoplanning) to be exploited to the full from within the CRM Salesforce solution, currently used by numerous companies. Available in the form of 3 cumulative apps, Opti-Time Cloud enables decision-makers and operational staff: to improve their customer knowledge (Opti-Time Cloud Geo) to prepare their movements better over the course of a day (Opti-Time Cloud Geo) thanks to version 2.0, to optimize the schedules of several agents over several days (Opti-Time Cloud Optim). Geoplanning for reliable, realistic and profitable scheduling of mobile service agents Opti-Time Cloud Optim puts a fully-fledged Geoplanning engine at the heart of Salesforce. Sales people, technicians and managers have direct access from their CRM to advanced route itinerary optimization features. The Optim version of Opti-Time Cloud uses powerful optimization algorithms to automatically generate optimal call schedules for several resources over several days while taking account of all business and geographical constraints (call frequency and priority, minimum required interval between calls, favorite days…). This enables sales personnel and technicians to achieve the maximum number of appointments while minimizing their movements, boosting productivity by 10 - 30%. Customers also benefit from better quality service (punctuality, flexibility…). Managing different user profiles enables a manager to access all his team's diaries and personally schedule the appointments for the coming weeks. 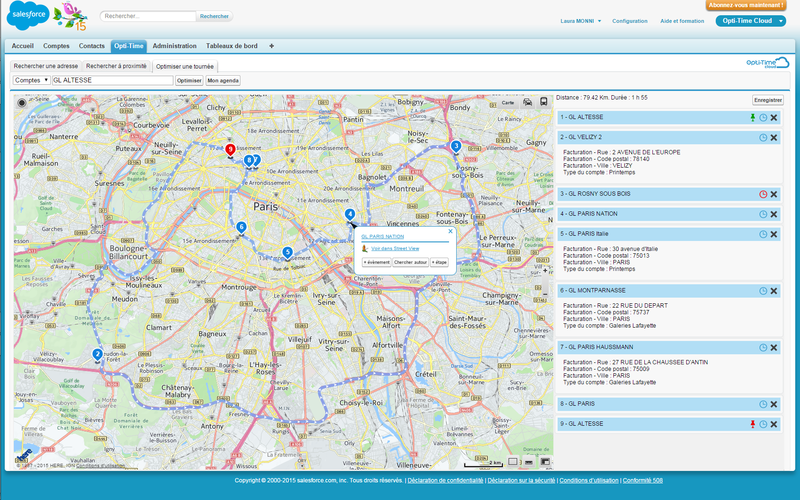 As with the Geo and Tour versions, Opti-Time Cloud Optim also allows the user to display all or part of his customer portfolio on an interactive map and to understand the environment (road networks, direction of travel, Points of Interest…), to target with pinpoint accuracy thanks to the search around feature, to improve the quality of his contacts database and to create geographical scorecards on scheduling and activity statistics. Customer knowledge is thus enhanced with a geographical dimension, and the efficiency of prospecting and customer loyalty activities optimized.Opti-Time Cloud Optim gives Salesforce users permanent access to up-to-date worldwide cartographic coverage, to accurate Geocoding tools and to powerful Geo-optimization tools. Essential data for providing up-to-date worldwide cartographic coverage To ensure its customers have access to up-to-date and worldwide cartographic coverage, GEOCONCEPT has linked up with Here Maps, the world leader in the provision of digital mapping information, and traffic and Geo-located data. A special partner of Here Maps for many years, GEOCONCEPT uses powerful web services to put intelligent location at the very heart of Opti-Time Cloud. Cartographic data, real-time traffic, public transport and Points of Interest are continuously available throughout the world. An open and scalable range Simple configuration interfaces and dedicated APIs enable Opti-Time Cloud's features to be easily integrated into existing Salesforce applications. GEOCONCEPT also offers a sophisticated geo-planning solution, Opti-Time, capable of feeding into the Opti-Time Cloud application (via a connector) or improving its performance (via a web service). Opti-Time Cloud 2.0 will go on sale in September 2015. Version 1.4 of the application is already available on the Salesforce Appexchange: among other features it provides access to geographical and search around features directly on the ground thanks to its compatibility with Salesforce1. Learn more about Opti-Time Cloud About GEOCONCEPT Created from the merger between GEOCONCEPT, Europe’s leading Geographical Information System publisher, and Opti-Time, which publishes software for professionals, today the GEOCONCEPT Group ranks today among the world leaders in enterprise cartographic and optimization applications.